The GeoTracker Mobile Mapping system is mainly built on standard components. The only component that is unique in the system is the GeoTracker control box that includes a computer, and an electrical interface to communicate with all the units/sensors. 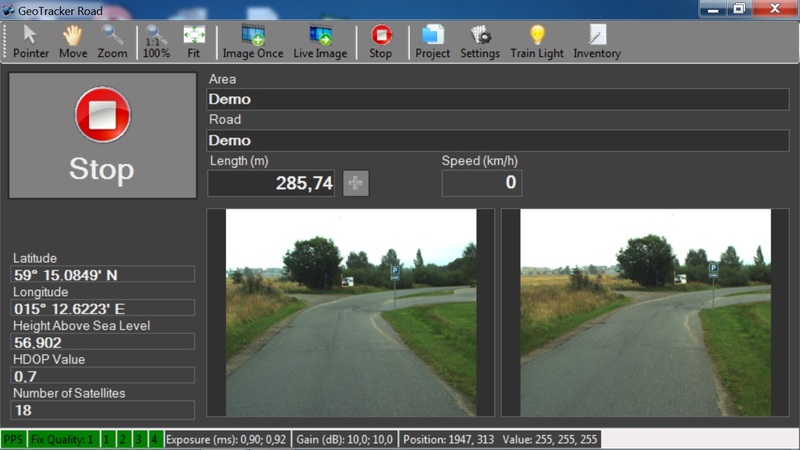 The software module for data collection is called GeoTracker Road. This module is built on a true real-time platform for industrial automation and machine vision system, Cit® that Swedvision have developed for industrial automation purpose. The use of Cit® is the secret behind the good accuracy in the system. GeoTracker Road instantly inform the user about all sensor status and the progress during data collection in an easy and user friendly way. There is also an extra module for real-time inventory in the field. This makes it possible to register and position different road and street assets in real time. The base components that is need to get GeoTracker up and running, is a GPS, inertial navigation system and a wheel speed sensor. What GeoTracker basically needs is serial GPS data (NMEA format), a PPS-pulse and the AB phase data from an encoder mounted on the wheel. Other sensors can be added according to customers requirements and needs.